This innovative book is the first comprehensive study of ancient Roman gardens to combine literary and archaeological evidence with contemporary space theory. It applies a variety of interdisciplinary methods including access analysis, literary and gender theory to offer a critical framework for interpreting Roman gardens as physical sites and representations. 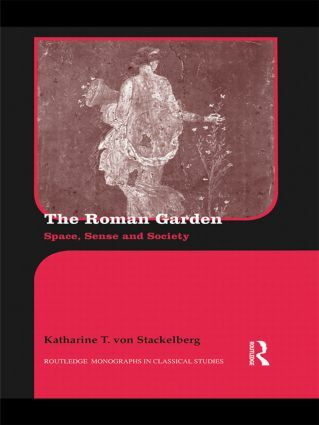 The Roman Garden: Space, Sense, and Society examines how the garden functioned as a conceptual, sensual and physical space in Roman society, and its use as a vehicle of cultural communication. Readers will learn not only about the content and development of the Roman garden, but also how they promoted memories and experiences. It includes a detailed original analysis of garden terminology and concludes with three case studies on the House of Octavius Quartio and the House of the Menander in Pompeii, Pliny’s Tuscan garden, and Caligula’s Horti Lamiani in Rome. Providing both an introduction and an advanced analysis, this is a valuable and original addition to the growing scholarship in ancient gardens and will complement courses on Roman history, landscape archaeology and environmental history.